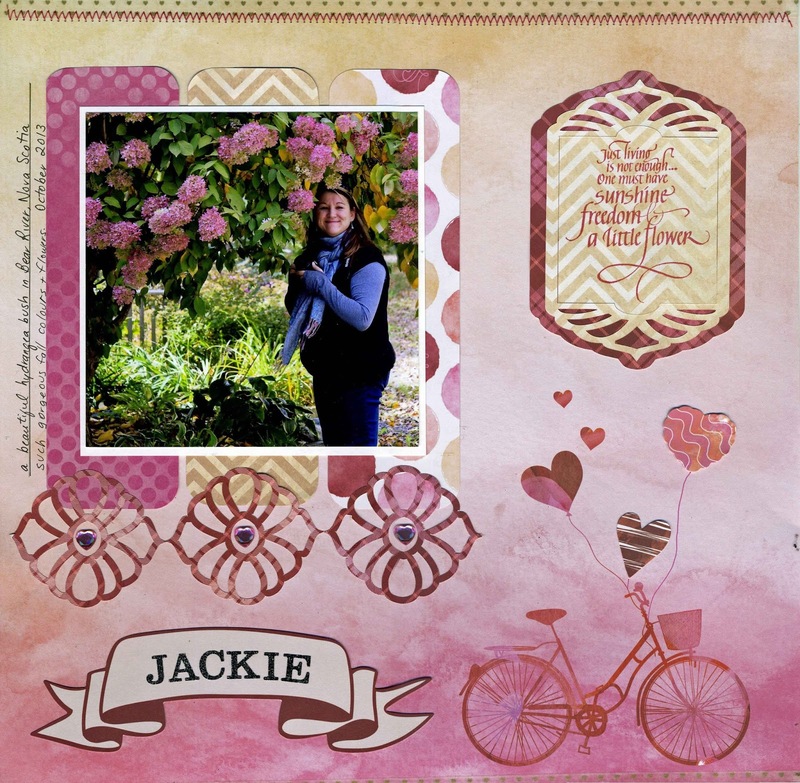 Hello, Connie Nichol here today with another scrapbook layout featuring a Quietfire Design stamp and an assortment of Elizabeth Craft Designs dies. 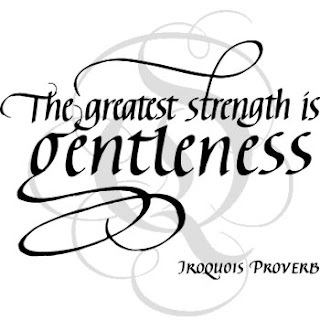 The stamp is an Iroquois proverb and is a relatively new addition to the Quietfire Design store. It just makes me think of big men and how gentle they can be with small children. Perfect for embellishing a layout about a father or grandfather interacting with kids. This particular photo is from my childhood that I scanned from a 35 mm slide. The resolution is not the greatest but it brings back fond memories of my grandpa who died in 1976. I used the Way with Words 'Happy' die from the Happy Anniversary set for the page title. I just sponged a little green ink on the diecut cut from white cardstock. The patterned paper is from the new Elizabeth Craft Designs 'Through the Lens' 6x6 patterned paper packs. I used three different sheets (two from the wood set and one from the stone series) and layered them under the photo. I liked the vintage textured feel of them. The stitched ovals, clouds and the pail/shovel die are also from Elizabeth Craft Designs. Although the latter is from a palm tree set there is no reason it can't work for a playground or sand box theme. 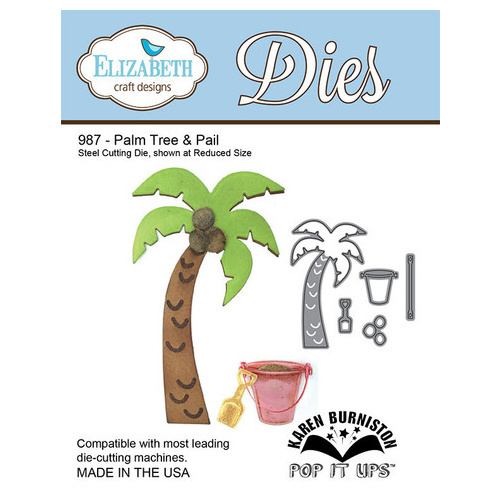 Like the 'happy' from the Happy Anniversary die set, remember to think outside the box a little when looking at your dies. So here is a project a little outside the norm. At CHA this year, I was lucky enough to be gifted with some fun pens by Sakura. So here is what I did with a few of them. 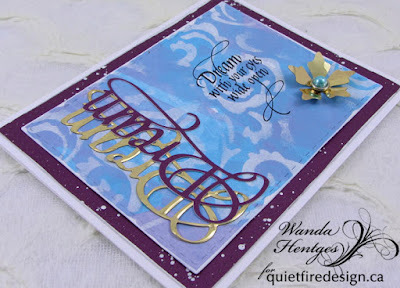 Lettering in gold and adding a few easy strokes and embellishments can make all the difference! When these letters catch the light, they simply glow. There is no end to the fun you could have! 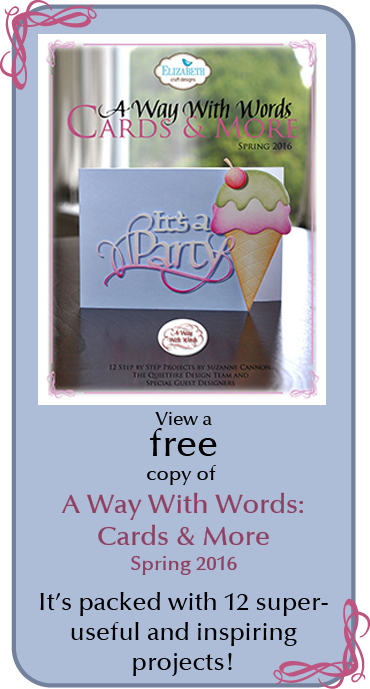 Simply add your own special touches to customize a birthday card with glitz and love. 1. Form a tent fold card base measuring 12 x 4.5” from dark coloured cardstock. 2. Cut a panel measuring 11 x 3.5” from the same dark cardstock and cut a slightly larger mat of the lighter coloured cardstock. 3. Lightly draw a baseline and a waistline across the smallest panel with your soapstone pencil to help keep your lettering straight. If your paper is textured, you might want to work on the smoother side. 4. Letter your sentiment with the Pentouch Calligrapher. 5. Create small hearts in the stem of each letter as shown, using Gelly Roll pens in red or pink. 6. Run strokes between each of the letters and through the counterspaces using pens in your favourite colours. 7. Draw little curls at the end of the phrase. 8. Add extra flourishes, hearts and dots. Have fun! 9. Assemble the card as shown with double sided adhesive. Erase the soapstone pencil lines with a kneadable eraser. I'd like to thank Sakura of America for supplying their product for this project and Prime Publishing (publishers of favecrafts) for sponsoring their Blogger Networking Event at CHA in January! This project is entered in the Prime Best Blogger Craft 2016 Contest. Hi everyone. 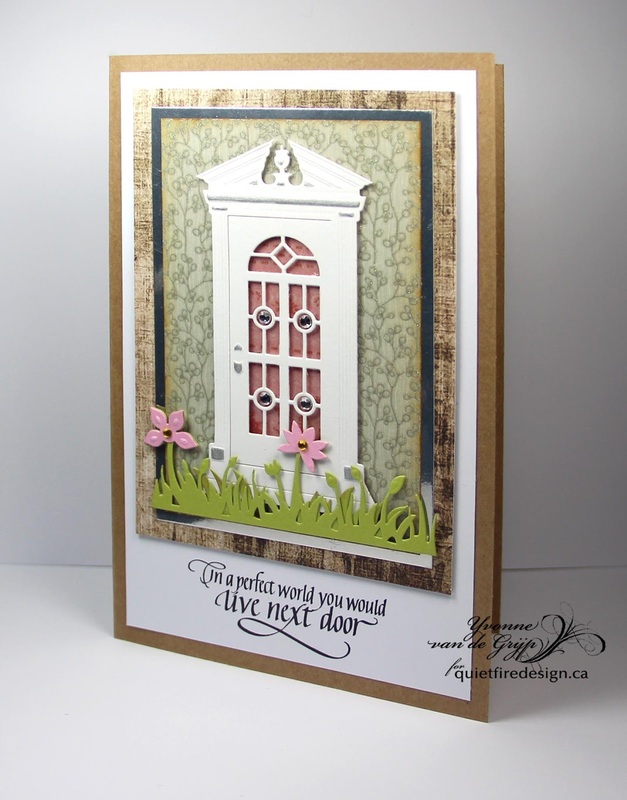 I'm Bonnie Garby from Make Time to Craft and I'm guest designing for Quietfire Design this month. 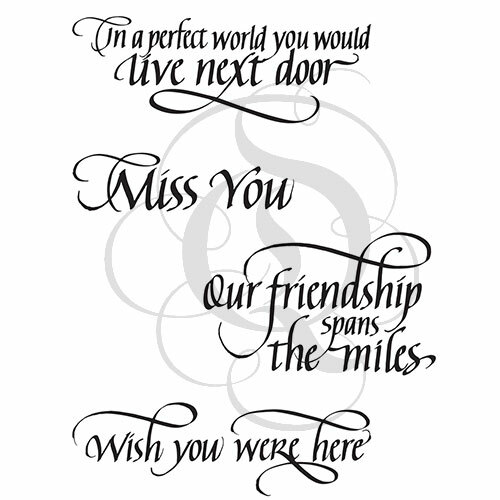 Today I'm back with a card featuring the wonderful 'I wouldn't have missed being your friend for anything' stamp. 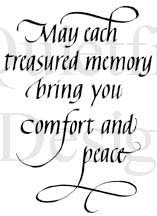 What a lovely quote for a card for a dear friend. This time I started with a 5-1/2" square card base. I stamped my beautiful sentiment on white cardstock with VersaFine Onyx Black ink. 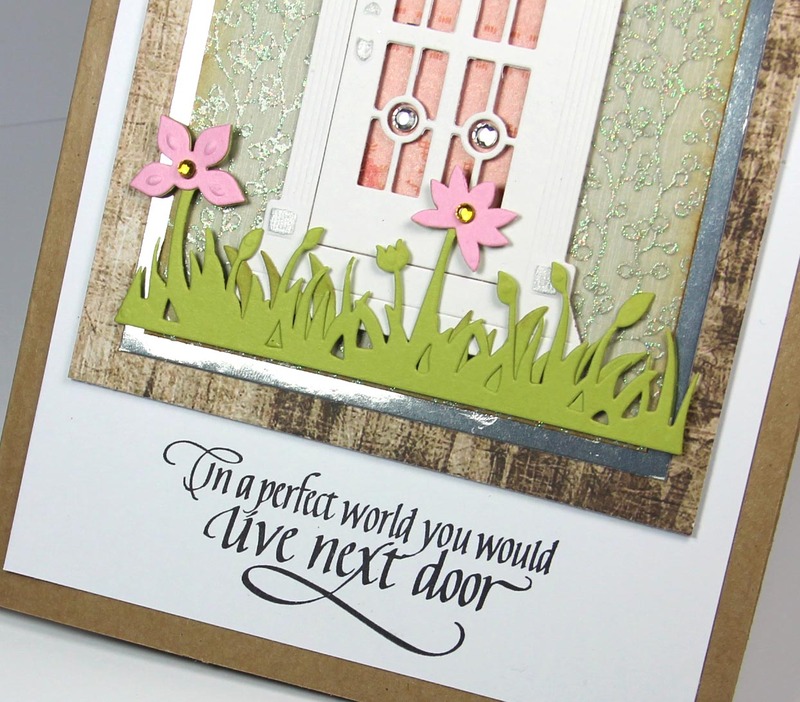 I die cut around the sentiment with the Large Silver Circle Pierce and Cut Tool and the Circle Classic Large Stacker die, both from Cheery Lynn Designs. For the background I cut a 5" square piece of white cardstock and backed it with Stick It adhesive. I centered the Lords & Commons Square Doily from Cheery Lynn Designs on the right side of the cardstock and cut it out. I then adhered the die cut to a piece of gray cardstock and trimmed leaving a narrow border. I then added layers of yellow and gray. Then I wrapped a piece of Metal Grey Diamond Satin around the center of the card and secured in back. Then I added a layer of white mulberry paper and attached the panel to the card base. Next I cut a piece of Yellow and Gray Confetti Dot Grosgrain Ribbon from Really Reasonable Ribbon and dove tailed the ends. Then I layered that piece over the diamond satin ribbon layer. 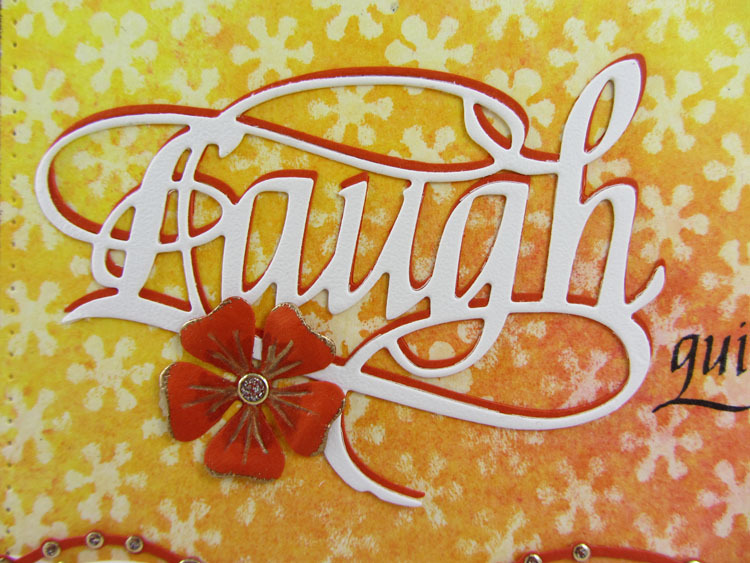 Then I attached the sentiment panel to the center of the card front using foam tape. 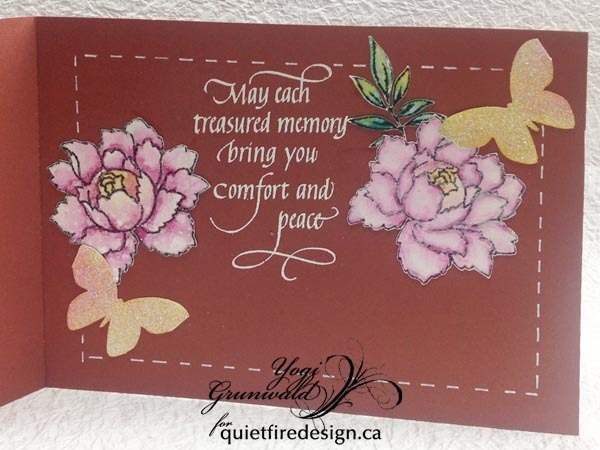 I created my roses with the Medium and Large Rose dies from Cheery Lynn Designs. I cut the flower layers from white cardstock and inked the layers with yellow ink. I sponged the edges with gray ink to define them. I cut the Tiny Fanciful Flourish Right and Left from Cheery Lynn Designs out of green cardstock. I attached the flourishes and roses below the sentiment. I created a bi-color double-loop bow using Lemon Delicate Stitched Satin and Metal Gray Diamond Satin Ribbon from Really Reasonable Ribbon on the Bow-it-All V2.0 Tool and attached it above the sentiment. I love finishing off a card with the perfect bow and this bi-color double-loop bow is a real show stopper. Thanks so much for stopping by today. I've enjoyed creating projects to share with you this month featuring beautifully calligraphed quotes from Quietfire Design. If you like my work, please stop by my Make Time to Craft Blog. 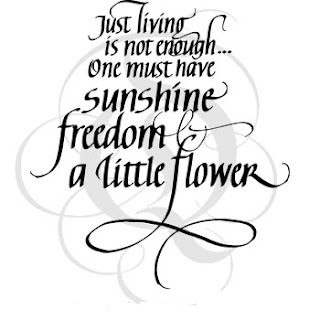 I will be sharing lots more projects featuring beautiful quotes from Quietfire Design in the coming months. This one word can mean so much. The special person who receives this card will think of you and smile every time its reflected shimmer catches their eye. You can have so much fun with this technique! It will be your customized creation. 1. 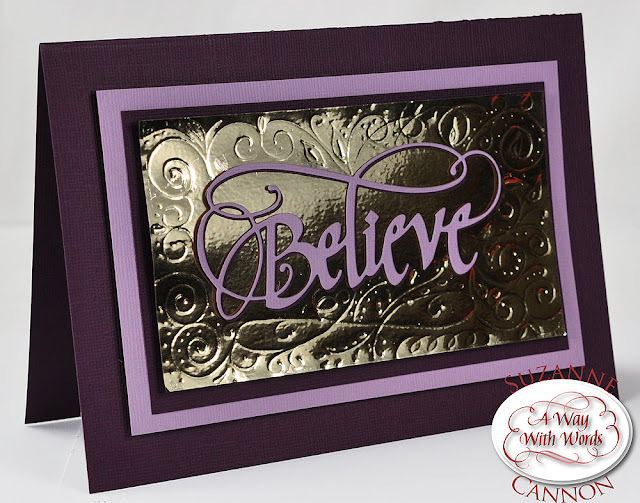 Form a 7.5 x 5.5” card base from dark purple cardstock. Cut one panel measuring 6.5 x 4.25” from light purple and one panel measuring 6 x 3.75” from dark cardstock. 2. Die cut one Believe from dark and one from light cardstock. Adhere them together, using Glue Dots, with the light coloured diecut on top and the dark diecut slightly offset behind so it appears as a drop shadow. 3. Cut a panel of smooth cardstock measuring approximately 6 x 3.5”. Cut a piece of Easy-Cut adhesive to 5.75 x 3.5”. Remove one side of the release paper and adhere it to the smooth panel. Run this through your diecutting machine for even adhesion. 5. 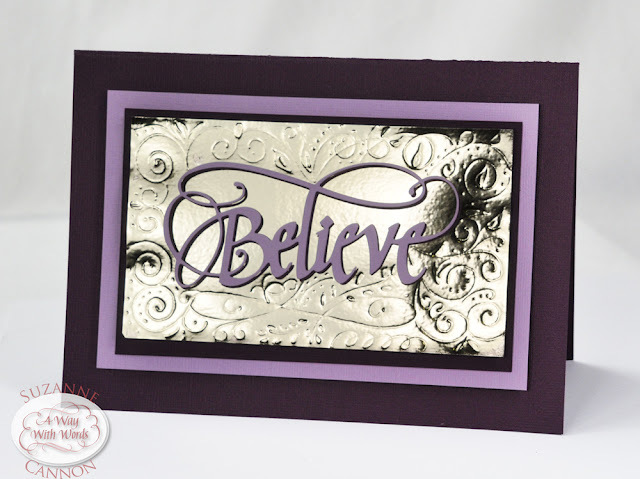 Adhere Believe into the middle of the foiled panel using Glue Dots. 6. Place foiled Believe panel onto the foam pad and use your stylus to emboss the surface by pressing firmly. 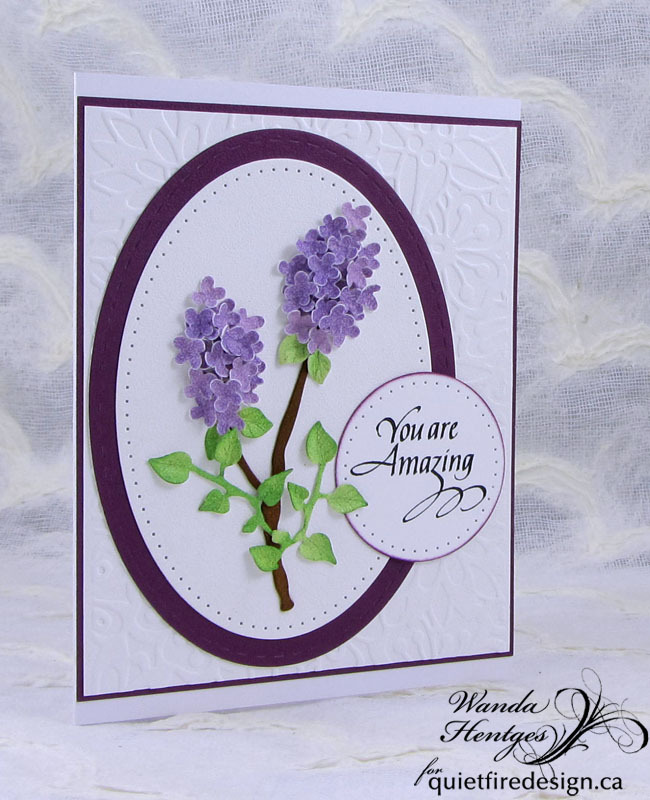 Draw flourishing designs and leaves and dots around the diecut. 7. Assemble panels as shown in the photo using foam adhesive. I'd like to thank Thermoweb for supplying their product for this project and Prime Publishing (publishers of favecrafts) for sponsoring their Blogger Networking Event at CHA in January! It's Suzanne popping in today. 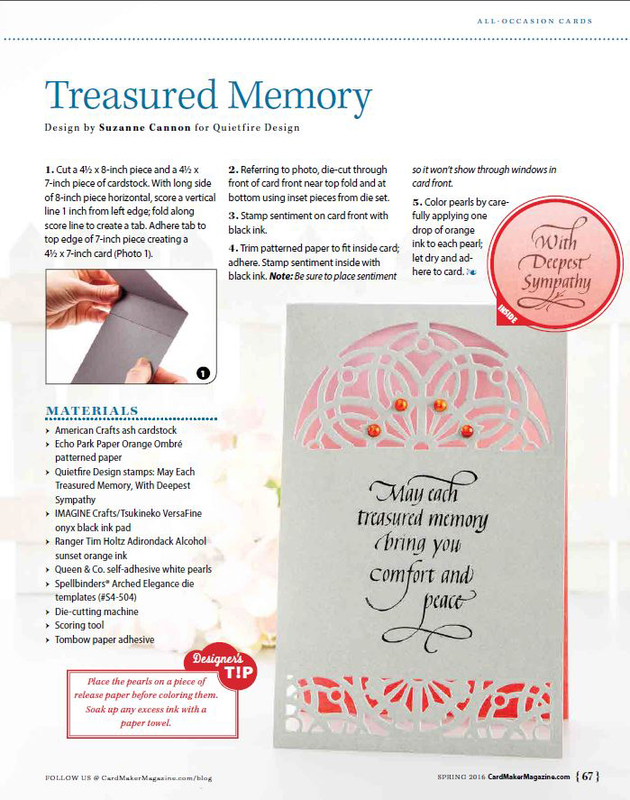 I'm delighted to be able to share my recent project which appeared in the Spring 2016 issue of CardMaker magazine! (I have permission!) This issue is available now on news stands with all sorts of good things inside. I used Becca Feeken's beautifully designed dies to compliment the seriousness of the occasion this card was designed for. It's clean and simple with a message from the heart for the heart. Thanks to CardMaker magazine for sharing my card in their publication! And thanks to you for dropping by to have a look. Teresa here today. It's a beautiful Tuesday and it's time to share a card i did with one of my favorite stamps sets for friendship. It's called "In a perfect World" and it's a set of 4 really beautiful stamps. It's always good to have a set of stamps that you can use to send out to friends and let them know they are loved and this is the perfect one. 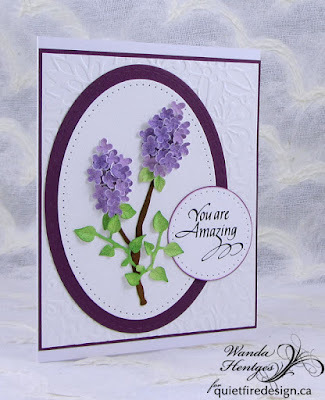 For my card i started with pretty spring papers from Carte Bella and white card stock. For the basic card i cut a white square about 5 1/2 inches and then cut a piece of the peach to fit on the back. Then i cut a smaller 3"strip of the flowered print to go across the middle of the card. This way it will give it a springtime look when the white die cuts are over the top. And you can use anything you have in your stash to make this layer. 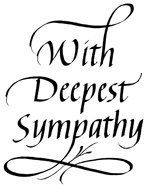 Just having the pretty die cuts makes the sentiment really stand out. And be sure and add 3D Foam squares for more of a dimensional effect. 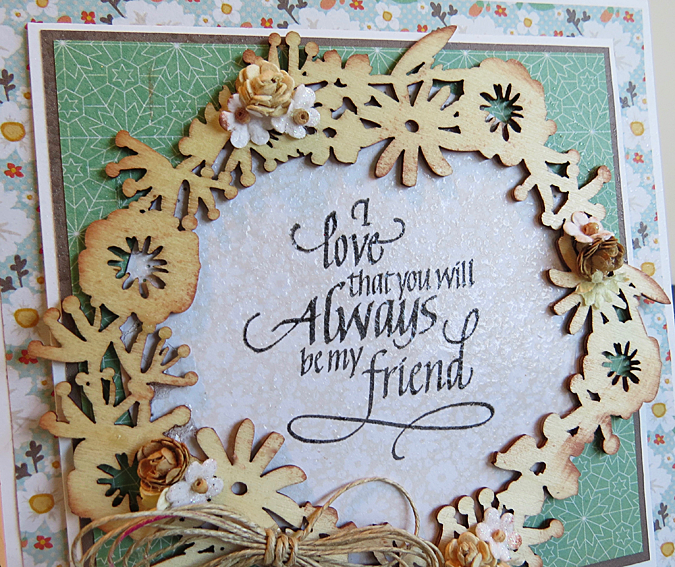 And for the sentiment i stamped it in Momento ink in Pistachio to match the green in the flower print. And i didn't want to make it too fancy so i just tied a quick double bow with peach seam binding ribbon and added a rose with a bit of glitter. And that's it. It's quick and easy and ready to get off to the mailbox to a friend. Here is a photo of the stamp set and all the other's that come with it. It's a really nice set. Thanks so much for stopping over and i hope that you have a really wonderful day! Yvonne here with a card to send to someone you miss having closerby. We are so lucky to have the internet to stay connected! Yogi here today. I used the sympathy die the other day, so it was still laying on my table... and then the Phoenix die is one of my newer dies that hasn't been put away yet... and you know the rest - one thing let to the next. 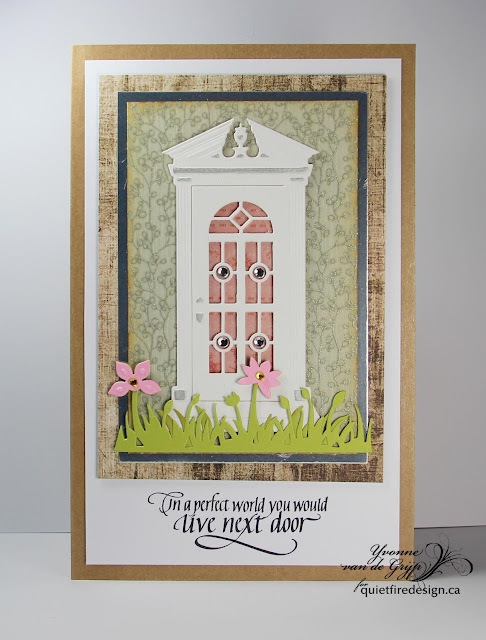 I'm using one of the "A WAY WITH WORDS dies from Elizabeth Craft Designs "With Sympathy" ("designed by Suzanne Cannon (also available HERE). Side folded my brownish toned card and spliced on another piece to create a 7"w x 5"h card. Inked the embossing folder (Cuttlebug Anna Griffin "Climbing Rose") using Distress "Ground Espresso", ran through e,bossing machine and then sponged "Antique Linen" all over, then used the Linen pad direct to paper to add depth. Trimmed down and adhered to front leaving a 1/8" border all around. 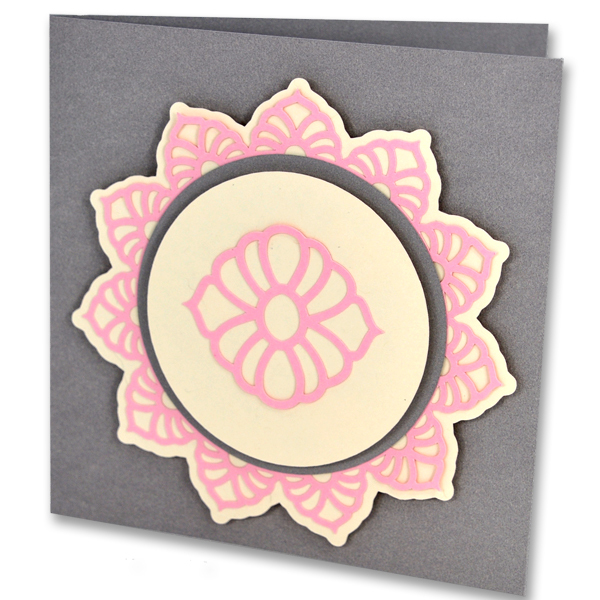 Adhered a piece of 1"h cream toned cardstock across the center, the width of my card. Adhered a piece of cream toned gauze ribbon. Die cut 4 of the "Phoenix" shapes (Creative Expressions Sue Wilson Gemini Dies), sponged with "Wild Honey" on the flower, "Twisted Citron" on the leaves and "Mermaid Lagoon" on the scrolls. Adhered them together to create the frame and then fussy cut the excess overlap from the outer edges. Adhered to card front. 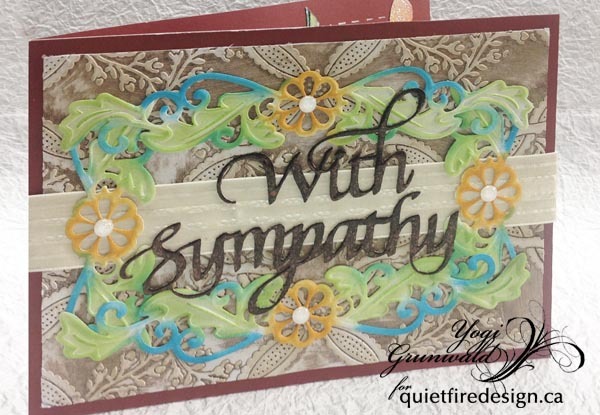 Die cut the "With Sympathy" (also available on Quietfire Design HERE) from white cardstock, inked with Versafine "Vintage Sepia" and embossed with Emerald Creek Hot Stuff "Burnt Copper Leaves" embossing powder. Adhered to card front. Final touch added white glitter enamel dots to the flower centers. On the inside: stamped the quote ("May Each Treasured Memory...") using Distress Picket Fence pad, and embossing with white detail embossing powder. Created an eCut file of the Peonies (Altenew), cut with my electronic cutter on CP watercolor paper (smooth side), stamped the Peonies then colored with Tombows, then spraying with Perfect Pearls "Perfect Pearls" mist. Adhered to inside. As a final touch added the white gel pen faux stitched border. The boys' music teacher recently purchased his first home and so I made a little gift basket. Side note: Shopping is not my forte unless it's at the craft store! And I find shopping for something as personal as a home pretty hard. What would you have gotten a bachelor? I enjoyed the making of the card so much more! 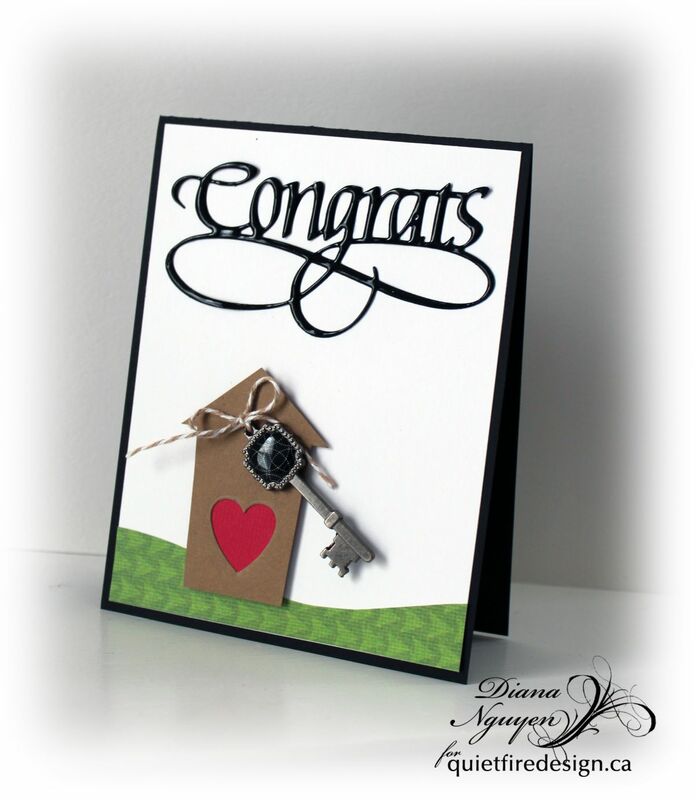 I kept it pretty simple with just a hand-cut house, a little key I had in my stash from long ago, and a gorgeously flourished Congrats die. The little heart is from the Elizabeth Craft Designs Tags & More 2- Deco. I used ultra thick embossing powder on a black die cut to make the die match the enamel part of the key. I think this is one of my favorite thing to do with these word dies! Hello, Connie Nichol here today with a scrapbook layout featuring a new Quietfire Design stamp 'Just Living is not Enough' and two Quietfire Design Floral Motif digital cutting files. I adore this quote by Hans Christian Andersen, and it is the perfect touch for many scrapbook pages. 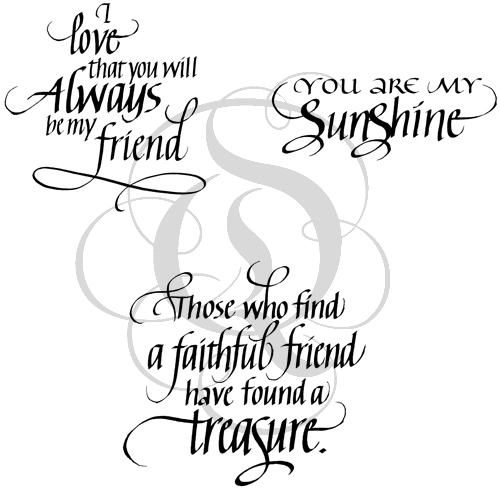 The calligraphic style of Suzanne Cannon makes it so very special. 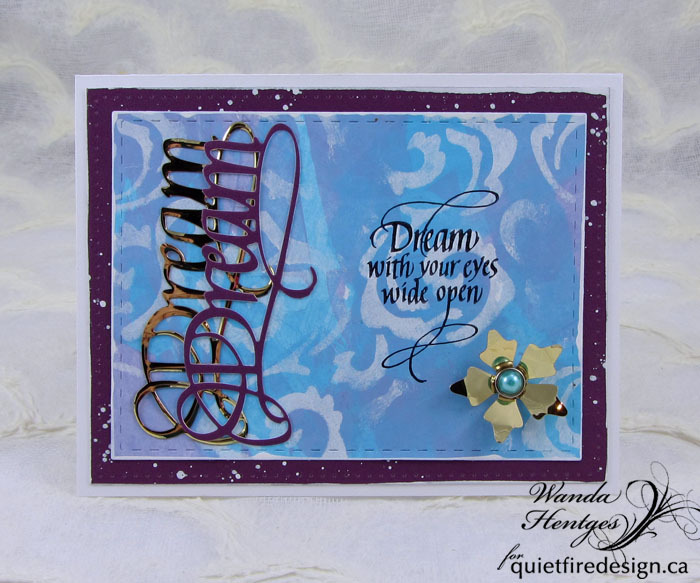 I cut the flower border and a tag from the Quietfire Floral Motif card and QF Floral Motif Box, Placecard and Label set with my Sizzix Eclips2. These cutting files come with a variety of designs within them, but I just ungrouped the images, picked the ones I wanted them and resized to fit my page. Ah, the beauty of electronic die cutting machines.... so much flexibility. The files are available as svg files from the Quietfire Design website or through the Silhouette Cameo store as studio files. Think of the possibilities. 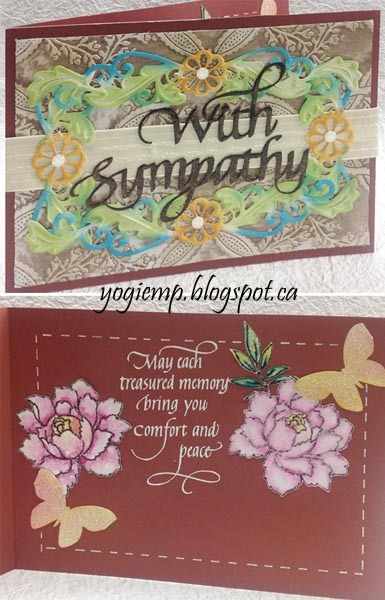 The patterned paper and banner diecut is from Creative Memories. I put a strip of washi tape at the top and bottom of the 12x12 piece of paper and stitched over this with my sewing machine to create a bit of interest at the top of the page. Simple and done. Thanks for looking! Happy Monday!!! It's Wanda here today!! I know... we don't always like Mondays... but we can chose to not let them get us down and instead To Dream!!! 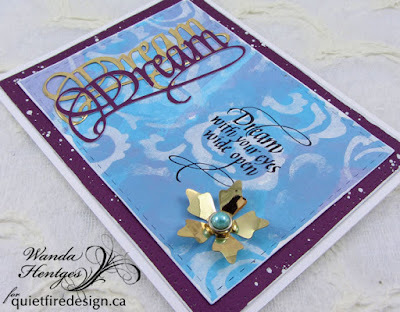 I'm sharing a card using the fabulous A Way With Words Dream metal cutting die and the stamp Dream with your eyes wide open. 1. Cut white cardstock 5 1/2" x 8 1/2". Fold to create top-fold 4 1/4" x 5 1/2" card base. 2. Die cut Dark Fuchsia paper with Stitched Rectangle die, splatter with white paint thinned with water, add white paint to edges. 3. Scrape blue and purple paint onto 1/4 sheet of white cardstock using an old plastic card, dry. Stencil white paint in some areas of the piece. Die cut piece with stitched rectangle die. Add white paint to edges. Attach to Dark Fuchsia panel. 4. Stamp "Dream with your eyes wide open" onto panel with black ink. Add white highlights to the word Dream with gel pen. 5. Die cut Dream from Gold Shimmer Sheetz and from Dark Fuchsia paper. Attach to panel as shown. 6. Die cut flower from Gold Shimmer Sheets, determine placement on panel, make hole through flower and panel, attach with brad, bend up flower petals. 7. Attach panel to folded card. I hope you've enjoyed today's card!!! And I hope you have a good week!!! Hi Everyone and thanks for stopping by today on the Quietfire blog to see what is new. 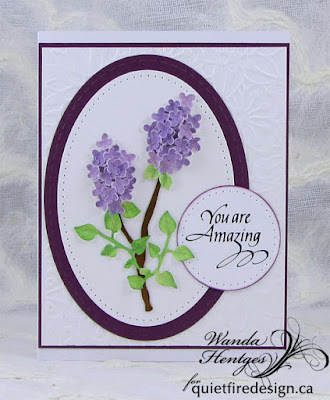 Today i am sharing a card with a set that i have used before because i needed a sweet card to send to a friend that i haven't see for awhile. I went over to Micheals last week and they had lots of these lazer cutouts in a big display so i bought some for later and one of them ended up being the perfect size for this sentiment. 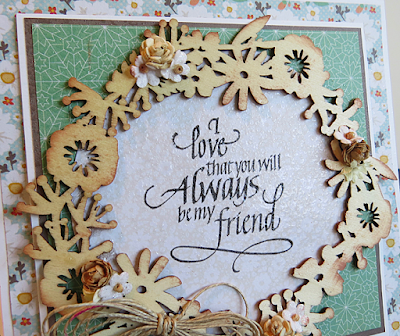 The stamp set is called "Always be my friend" and has 3 wonderful sentiments on it to use. For the papers i used a new line called Chickaniddy. I think the colors were great in that it gave it a real country feel to go with the wood lazer cut. And i just kept it simple stamping on a circle of the paper and embossing it with clear. And then i layered the papers under it and popped up one layer to give it more dimension to go with the thicker piece of wood. I just inked the lazer cut with some brown ink but you could paint it, spray it or emboss it with anything to make it fun and unique for your card. And then to finish my card i just added some little country looking flowers and a twine bow at the bottom with a quick dry adhesive. Simple and perfect for my friend. inspiration to make up something fun today! Hello there. 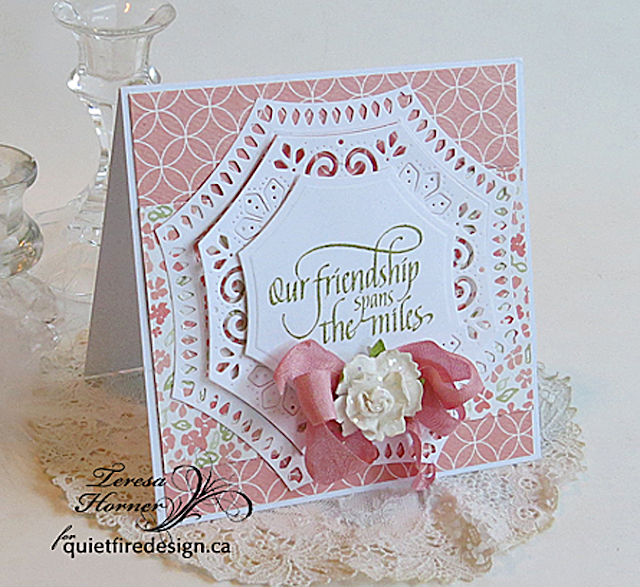 I'm Bonnie Garby from Make Time to Craft and I'm thrilled to be guest designing this month for Quietfire Design. My card today features the new Just Living is not Enough stamp. This is such a lovely sentiment. I started with an A2 top-fold card base. 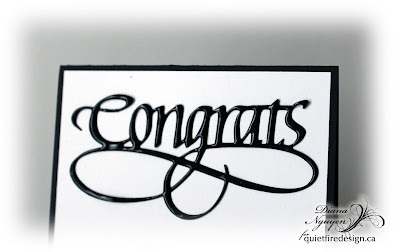 I stamped my sentiment on white cardstock with Versafine Black Onyx ink. 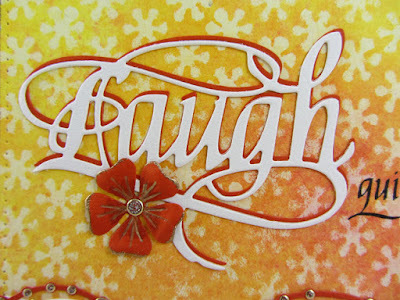 I die cut the sentiment using the Oval Stitch and Cut Tool Lge and matted it with the Oval Classic Large Stacker die, both from Cheery Lynn Designs. For the background, I cut a 4-1/2" x 6" piece of white cardstock and backed it with Stick-It adhesive. I centered the Meriterranean Lace Rectangle Frame die from Cheery Lynn designs on the right side of the paper and cut it out. I then adhered this die cut to a purple base and trimmed to 3-5/8" x 4-7/8". Then I adhered that to another piece of purple cardstock and trimmed a small border. Next I ran a 4-1/2" long piece of 5/8" Delphinium Diamond Satin Ribbon from Really Reasonable Ribbon across the center of the card and adhered it to the back. Then I cut a 4-1/4" long piece of 3/8" wide Purple and Green Confetti Dots Grosgrain Ribbon and dove-tailed the ends. I adhered that to the top of the first ribbon strip. Next I adhered a piece of white mulberry paper to the back of this panel and feathered the edges by wetting first with water and then tearing. Then I adhered this to the base card. 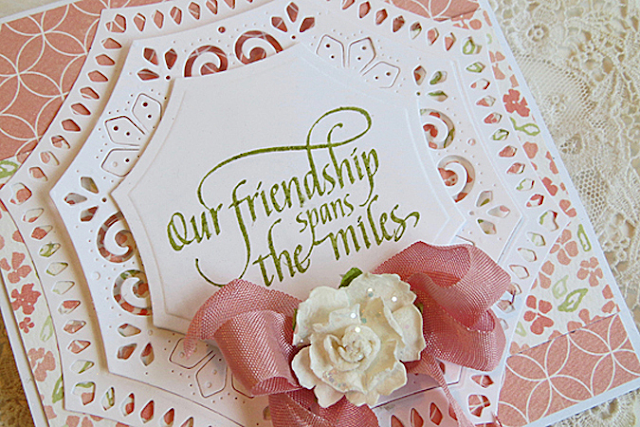 Add the sentiment panel to the center of the card with foam squares to give it a little dimension. Create the daisy flower with the Shasta Daisy die from Cheery Lynn Designs and add the Olive branches greenery to each side. My beautiful bi-color, double-loop bow was created with two ribbon styles from my March Ribbon Club assortment from Really Reasonable Ribbon. The theme for the March assortment is Spring and this assortment contains a variety of colors and styles that lend themselves to projects with a spring theme. This bow was created on my Bow-it-All V2.0. 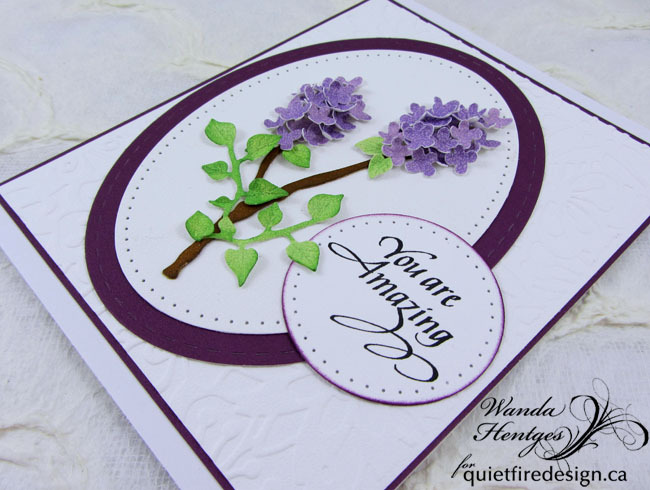 I just love creating cards around inspiring sentiments and Quietfire Design is the perfect place to find lots of wonderful sentiment stamps and other great papercrafting supplies. Thanks so much for stopping by today. I hope you liked my card. Hi!! 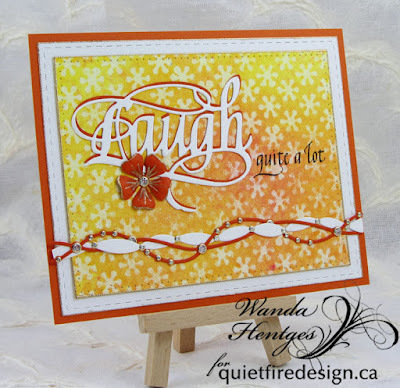 I'ts Wanda here today to share a card using the Laugh die and one of the stamps from the Queen of Everything Set of 10. To laugh is good medicine so we ought to laugh quite a lot. 1. Place Flower Stencil over piece of watercolor paper, sponge Matte Medium through Stencil, remove Stencil, clean Stencil, dry paper. 2. Spray paper with color, blot off excess color with a paper towel and dry. The matte medium resists the color leaving the flowers lighter. 3. 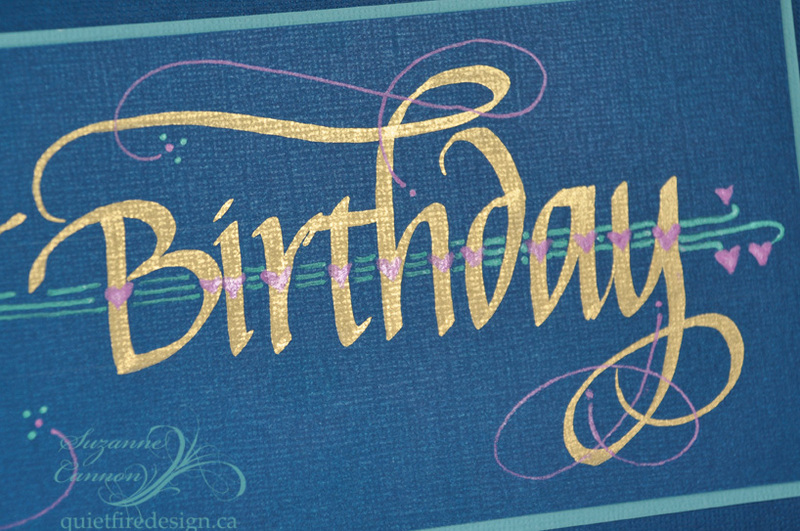 Cut paper with Stitched Rectangles Die (next to largest die), ink edges with Versamark and emboss with Gold Powder. 4. 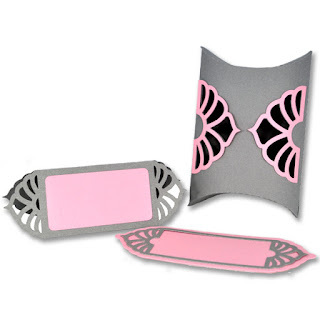 Cut Soft Finish Cardstock with largest Stitched Rectangle, ink edges with Versamark and emboss with Gold Powder. 5. 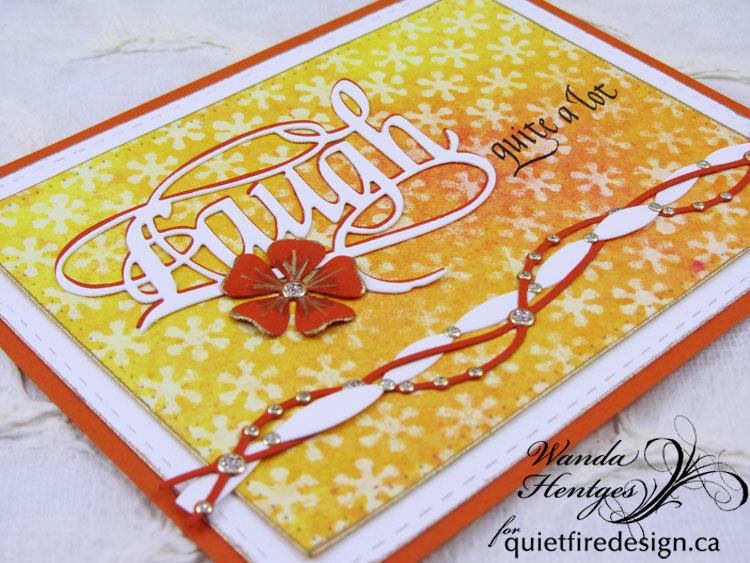 Attach background to white layer and then to orange cardstock. 6. Cut Laugh from Soft Finish Cardstock and from orange cardstock, layer together and glue to card. 7. Stamp "quite a lot" with black ink. 8. Die cut Ribbons from Soft Finish Cardstock and orange cardstock as shown, place Glitter Sticker Circles as shown, weave Ribbons together and glue to card. 9. Cut Flower from orange cardstock, darken center with a marker, ink edges with Versamark and emboss with Gold, add Gold Gel Pen details to petals and sticker to center, shape petals and glue flower to card. I hope you've enjoyed this card and that you get to laugh quite a lot today!! !